Get your wallet and start using FairCoins today! You need a digital or paper wallet to store and spend your FairCoins. Some wallets can manage several addresses. Download from Google Play Store or from here directly (may require to allow installations from unknown sources). We recommend to backup the wallet file, which you even can run on a second Android device in parallel. Not yet available, expected in summer 2018. If you are a programmer and want to help with that task, a good starting point may be to adapt copay or fairbread. Go to faircoinpaperwallet.com and create an offline wallet. 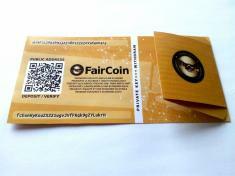 Select "Faircoin" in the top right menu, print, cut and fold it. The random address is unique and you can store any amount on it. You can clear the paper wallet with the Android App (all stored amount at once). Another simple way to set up your wallet is to sign up with HolyTransaction . It is hosted by a provider, whom you need to trust. We recommend to use it only for small change for your daily business or for testing. Electrum for FairCoin is a secure and easy to use wallet for Windows, Mac, Linux and Android. You can define several addresses and assign labels to each. Electrum connects to an Electrum server which helps with the crunching of numbers, but your keys are only with you. Electrum is ideal for organisations, as you can run several clients with the same address, which you can share with a seed (a long row of words as a common passphrase). When activating the cosigner plugin, you can define how many people need to sign for a transaction. This is the wallet with most features. It downloads the full blockchain. You can get it for Linux, Windows, Mac and Pi from download.faircoin.world. If you install a fresh wallet it takes some time to download all the blocks. You cannot make transactions until this process has completed. You run a Core Wallet and have your wallet.dat stored on an external disk or change your computer and want to get back the FairCoins? Simply replace the wallet.dat file. If you use a Core Wallet on Linux, it is situated in the ~/.faircoin2 folder. If you use an Electrum Wallet, you can use it from several computers, just enter the seed phrase on each. An Android wallet can be also used on several devices, just share the wallet file. A full node wallet can only be use don one computer, though. Make sure your firewall allows Port 40404. If a transaction gets stuck in your Android Wallet it's most probably for this reason: it only gets sent if the FairCoin wallet app has established at least 6 connections (4 on low memory devices) to other nodes. You can bypass this security limitation by opening your wallet, switch to airplane mode, wait 10 seconds and quit airplane mode again. As soon as your phone is connected to the internet again it will send the transaction. After two years of planning, developing and testing, we have been moving FairCoin to a Proof-of-Cooperation blockchain on 18th of July 2017. Please install the new version of the FairCoin wallet from here. All coins have been transferred automatically to the new blockchain. Any transaction on old wallets will not succeed anymore, unless you have upgraded.